He’s a double world champion, multiple race winner and one of the greatest drivers of all time, but somehow Fernando Alonso has managed to top all of those achievements by becoming the undisputed king of Formula 1 memes. We take a look at his meteoric rise to memedom. Back in 2010 victory jumps were all the rage – Mark Webber’s Hungarian GP celebrations became the perfect photoshop fodder, and a few races later Alonso’s leap after winning in Singapore had a similar result. After taking part in an awesome celebration of 60 years of Ferrari wins at Silverstone in 2011, Alonso was a little late for the drivers parade truck and had to chase after it. As he tried to catch up a photographer got a great photo of him pulling a lovely face, and F1 fans whipped photoshop out once again, with hilarious results. It was a special weekend all round, as he went on to win the race. Alonso’s win in the 2012 Malaysian Grand Prix was pretty epic, and once again his podium antics were ripe for ‘shopping. This time he was transformed into a London bus driver, ferrying other classic memes of the day to and from… wherever memes need to go, presumably. When Fernando first joined Twitter his followers were treated to all kinds of weird and wonderful insights into his life, and a photo of him before a much needed haircut obviously ended up getting the photoshop treatment. Bonus points for including that horrific waxwork. It would be a little while before Fernando provided some new material (although his return to McLaren did provide plenty of comical team radio). 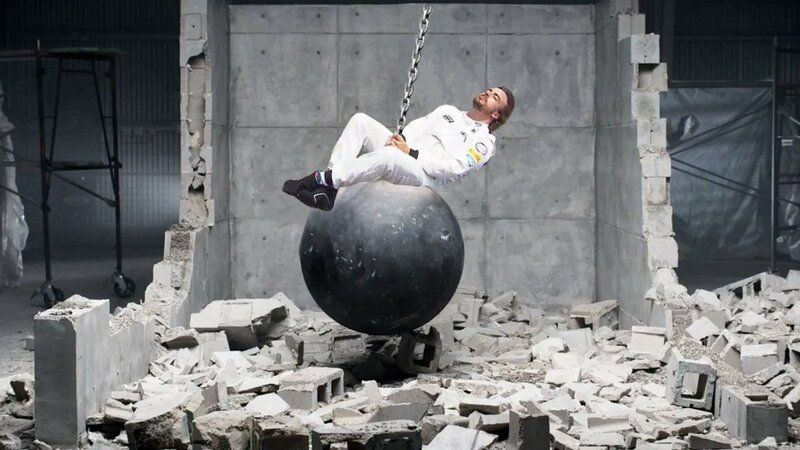 Then, out of nowhere, at the 2015 Brazilian GP the PlacesAlonsoWouldRatherBe hashtag lit up social media, gifting fans with probably the greatest F1 meme of all time. It became so popular that Fernando himself tweeted about it, McLaren referenced it in an episode of Tooned and even the FIA paid tribute to it in the FIA Gala end-of-season video. This really was peak memeage. Undoubtedly desperate to retain his position as F1s King of Memes, a five-a-side football match before the Italian Grand Prix in 2016 gave us a wonderful image of Fernando performing a sliding tackle. It was ripe for editing and the internet obliged, and we were all treated to another dose of comedy gold. Already by now the undisputed champion, F1 fans could barely believe their eyes when Alonso’s McLaren broke down during Free Practice 2 at Interlagos in 2016. Were we about to be provided with some new source material? Of course we were! He soon found a deckchair and the photoshops kicked off once again. And that, Ladies and Gentleman, is how Fernando Alonso became the king of F1 memes.